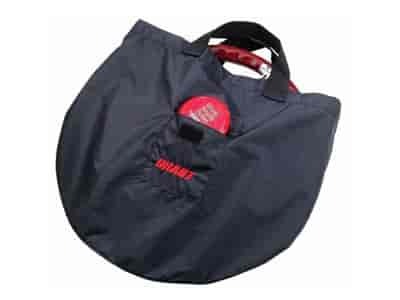 Vehicle Security System Carry-Along Bag. A convenient accessory to carry and protect your wheel when removed from the vehicle. With a Grant Vehicle Security System (designed to be used with Grant Steering Wheels and Kits), you can remove or replace your steering wheel in less than five seconds. A patented lock-out cap snaps onto the steering column to further assure the security of your vehicle. So you can simply take your wheel with you wherever you go. Unlike conventional alarms, this revolutionary aerospace designed system cannot be affected by motion. Another big advantage is the fact that it doesn't rely on your battery. You can store vehicles indefinitely. It cannot be bypassed, as many of the ignition cut-off devices can. The Grant Security System is ideal for most makes of cars, trucks, vans and boats. The ultimate answer to vehicle theft: No Wheel, No Steal. Grant's Vehicle Security System can only be used with a Grant custom Steering Wheel and Standard Installation Kits (3000 & 4000).